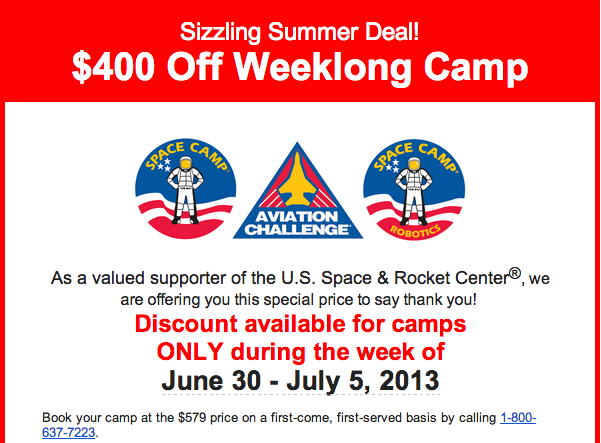 If you’ve been on the right Space Camp mailing list, you’ve probably seen several emails recently offering some great discounts on Space Camp. With extra capacity in some programs, Space Camp has been offering certain camps at the barn-burner price of $579 ($400 off) for the week when you book camps taking place in the very near future. The latest offer was for camps starting the week of June 30. I mention this just in case you haven’t been getting these deals. My thought is that they’re probably sending these out to anyone signed up for the Alumni Community. And so if you think you might be able to take advantage of these short-notice specials sometime this summer, it’s probably best to go register!